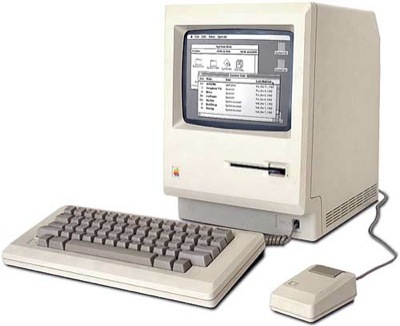 Released with much fanfare in January of 1984, the Macintosh was the first affordable computer to include a Graphical User Interface. It was built around the new Motorola 68000 chip, which was significantly faster than previous processors, running at 8 MHz. The Mac came in a small beige case with a black and white monitor built in. It came with a keyboard and mouse, and had a floppy drive that took 400 kB 3.5" disks--the first personal computer to do so. It originally sold for $2,495. Thanks to Eric Rasmussen For OS info.